This artist's concept shows the Corot-2 system, which is found about 880 light-years from Earth. Material is being stripped off the planet at a rate of 5 million tons per second as the star pummels it with an intense X-ray barrage. A nearby star is drubbing its close-orbiting planet with a barrage of X-rays 100,000 times more powerful than what the Earth receives from the sun, a new study has found. That intense, high-energy radiation is blasting about 5 million tons of matter from the gigantic planet into space every second, researchers said. They made the observations using NASA's Chandra X-Ray Observatory and the European Southern Observatory's Very Large Telescope in Chile. The star, which is located about 880 light-years from Earth, is known as Corot-2a. Optical and X-ray data suggest that Corot-2a is between 100 million and 300 million years old, meaning it's fully formed, researchers said. The star's one known planet, called Corot-2b, was discovered in 2008 by the French Space Agency's Convection, Rotation and planetary Transits (Corot) satellite. Corot-2b is about three times as massive as Jupiter, and it orbits very close to its parent star — just 3 percent of the Earth-sun distance (which is 93 million miles, or 150 million kilometers). The huge, close-in alien planet may be playing a role. "Because this planet is so close to the star, it may be speeding up the star's rotation and that could be keeping its magnetic fields active," said study co-author Stefan Czesla, also from the University of Hamburg. "If it wasn't for the planet, this star might have left behind the volatility of its youth millions of years ago." Other observations suggest that Corot-2a might have a stellar companion that orbits at about 1,000 times the Earth-sun distance. Instruments have not picked up an X-ray signal from this star — perhaps because it does not have a close-orbiting planet to kick it into high gear, researchers said. Corot-2b appears to be unusually inflated for a planet in its position. That could be another result of the X-ray barrage, researchers said, but they're not sure yet. 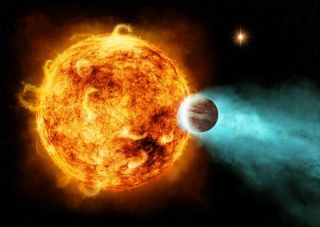 "We're not exactly sure of all the effects this type of heavy X-ray storm would have on a planet, but it could be responsible for the bloating we see in Corot-2b," Schroeter said. "We are just beginning to learn about what happens to exoplanets in these extreme environments." The results were published in the August issue of the journal Astronomy and Astrophysics.